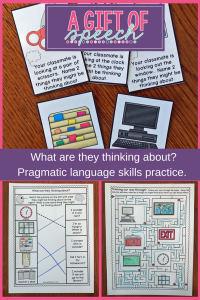 Teaching pragmatic language for our younger students! This year I have quite a few young students with social/pragmatic language disorders. I am co-teaching a social/pragmatic group of kinder and 1st graders with our campus special education teacher. She and I both love the Social Thinking Curriculum by Michelle Garcia Winner. We are currently using “The Incredible Flexible You Curriculum Set” for our younger group. The books and activity manual offer some fantastic tools for teaching Social Thinking. I created this activity to supplement and offer further opportunities to practice the concepts of expected and unexpected. This activity has minimal preparation because honestly, I don’t always have much prep time. 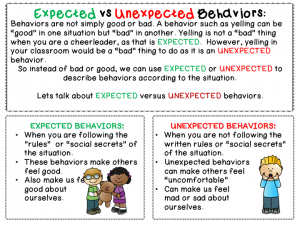 The following are just some of the pages to extend the concepts of expected versus unexpected behaviors. 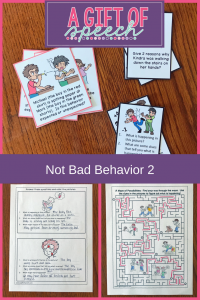 You can check out the entire activity “Not Bad Behavior – Expected versus Unexpected Behaviors” on TPT. 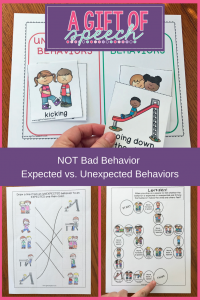 What are some ways that you teach expected versus unexpected behaviors? What are they Thinking and Not Bad Behavior 2!